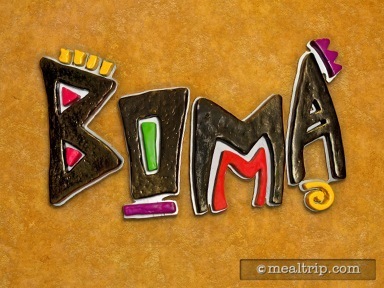 Boma was designed to resemble an African marketplace with thatched ceiling treatments and bamboo fencing that separates various parts of the large dining area. These details are easier to see at breakfast, where there is a fair amount of shaded natural light softly pouring in from the floor to ceiling windows in the giant "bay window" section of the main dining room. Both breakfast and dinner are buffet-style at Boma and it's (so far anyway) still not a character meal (as many buffets at Disney tend to be). In the morning, the menu tends to be a little more American with a few African touches here and there. If you have to start the day with a dark roast coffee, Boma features a press pot of Kenyan AA that's quite good… but it's not your local mom and pop, American style coffee. It's real Kenyan AA! There are at least 45 items on the breakfast buffet, so everyone is sure to find something they will enjoy. There are unique African-inspired items like Pap and Chakalaka and Turkey Bobotie, but there's also cold cereals, fresh fruit and many kinds of fresh baked pastries to choose from. If you're looking for something in-between adventurous and the norm, there are several kinds of fresh carved meats available like Breakfast Ham and a Cured Pork Loin and all manner of fluffy eggs, a frittata or two, biscuits and gravy, and event a banana or pecan praline bread pudding… which it's totally okay to eat in the morning… it's not dessert until after noon!